Wednesday October 17th 1894 I was busy all forenoon with the work, had early dinner and went to town. I was over home awhile and at the church to work in the quilt. Will and others were working on the well till nearly night. 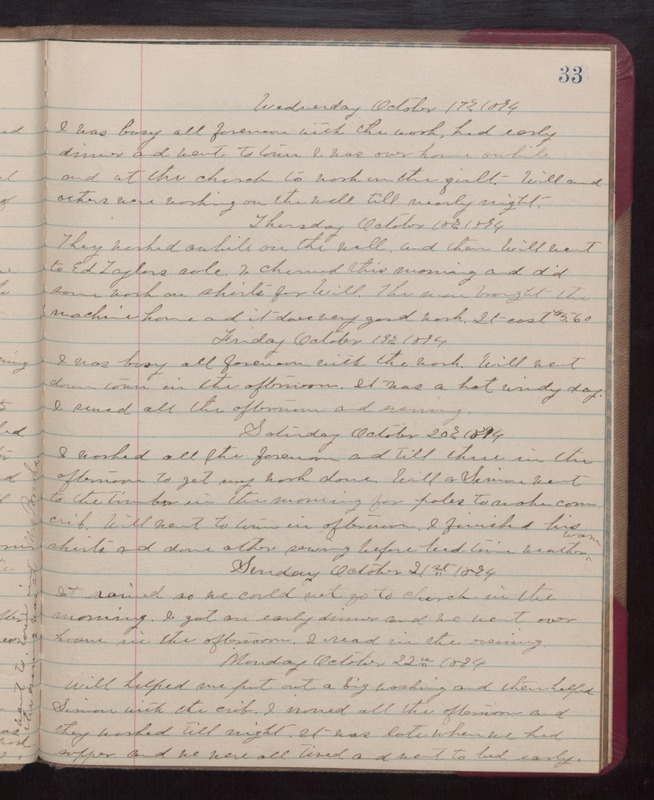 Thursday October 18th 1894 They worked awhile on the well and then Will went to Ed Taylors sale. I churned this morning and did some work on shirts for Will. The men brought the machine home and it does very good work. I cost $5.60 Friday October 19th 1894 I was busy all forenoon with the work. Will went down town in the afternoon. It was a hot windy day. I sewed all the afternoon and evening. Saturday October 20th 1894 I worked all the forenoon and till three in the afternoon to get my work done. Will and Simon went to the timber in the morning for poles to make corn crib. Will went to town in afternoon. I finished his shirts and done other sewing before bed time. weather warm. Sunday October 21st 1894 It rained so we could not go to church in the morning. I got an early dinner and we went over home in the afternoon. I read in the evening. Monday October 22nd 1894 Will helped me put out a big washing and then helped Simon with the crib. I ironed all the afternoon and they worked till night. It was late when we had supper and we were all tired and went to bed early.